Posted in From The Vault, Wyoming on April 30, 2013 by Dave Showalter. Holy cow, what was that doing in the vault???!!!! Doesn’t get much better than this! Uh, Ummm, I was focused on shooting the other direction (northeast) towards the area that was leased for drilling. I stood up there solo that night and thought about how things would change with 136 wells and all of that traffic down below me. Even up in the wilderness, there would be no darkness, no silence. I’m really happy about the outcome, which gives me hope that regular folks can move the needle – there’s one challenge left in the Wyoming Range – the area known as “The 44” has been contested and no surprise, industry would really like to drill there. 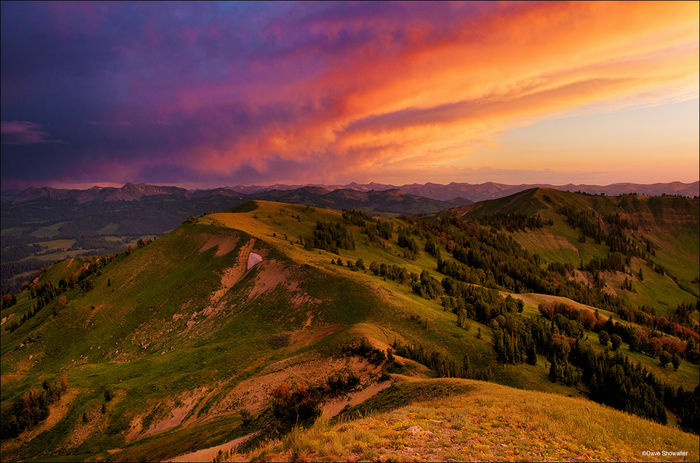 I’m optimistic that the Upper Hoback protection will be the catalyst to make the 44,720 acre parcel part of the Wyoming Range Legacy Act and forever wild. My grandfather’s dry farm was in Swan Valley, my father hunted the Upper Hoback. I applaud and appreciate your work. In Yellowstone May 26 to June 14. Then the class is 9/28 to 10/5. Welcome for a steak, baked potato, green salad and garlic bread anytime. Thank you Bob, and I didn’t know you had connections to the Wyoming Range. You know how special the Upper Hoback is! I’ll let you know if I’m heading your way – a fall YNP trip just mayt happen.